In a little over one month from now I will be making Nürburgring trip #2. Given the last one was back in 2006 it’s not a great hit rate is it. Alas, being 15,000km+ away makes it difficult to pop over for a weekend visit! So, once again, I find myself watching videos of cars driving around the Nordschleife. 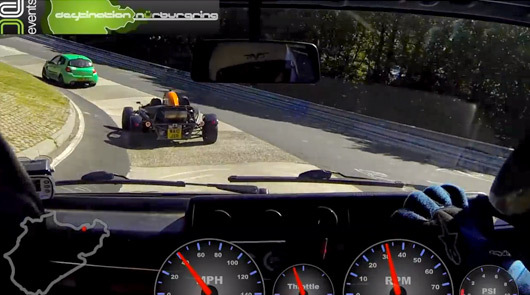 Thanks to Wayne Moore for bringing this video of Dale Lomas lapping in one very cool Ariel Atom. After a bit of research on the video I discovered it has partner clip, filmed from Nigel Pinder’s rather special if ungainly looking Mk2 Golf. Strap yourself in and enjoy these clips from two guys who their way around this most awesome of tracks!